Before start with frameworks, I assume that you have worked in core PHP. Everyone knows that in Core PHP you have to write and manage lot code. You must care about the Session, Routing, Authentication and other stuff that will make your code more complex and complicated. A framework is something which provides a lot of functionality which is already written, tested and ready to use. There are lots of pre-build libraries for the session, form-validation, url, authentication in a framework which you don’t need to write again and save your lot time. The framework is faster, because it allows developers to save time by re-using generic modules in order to focus on other areas. Here is a collection of best and most famous PHP frameworks based on their functionality and popularity. Normally, all frameworks follow the MVC rules. Here MVC stands for MODEL, VIEW and CONTROLLER which is standard software development process. There are several frameworks that could be used as a quick RAD (Rapid Application Development) tools. If you're a web developer who's in need of a simple and an elegant toolkit for creating feature-loaded and visualling impressive web applications, then Codeigniter is the framework for you. Currently available in its version 2.2.1, Codeigniter comes with clear documentation. Some other interesting features of this PHP framework include: nearly zero configuration, no large-scale monolithic libraries, compatibility with standard hosting, no restrictive coding rules, no need for template language and many more. 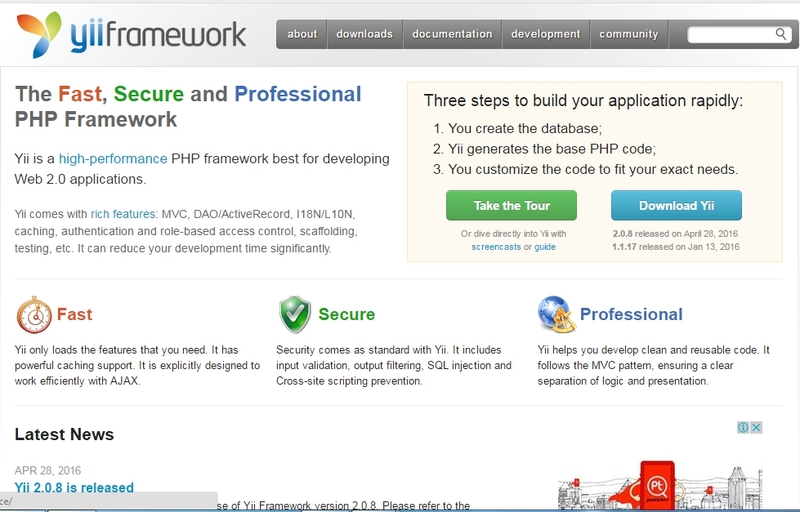 It is a frame work which offers developers simple set up options. Even a beginner finds this platform ideal for setting a task. Like CakePHP, Codelgniter has massive community support. The library is not so exhaustive or refined as in other platforms. Lack of default modular separation of codes. It is difficult to maintain or modify codes. Considered as a contemporary framework for PHP development, CakePHP 3.0 comes loaded with remarkable features including enhanced components and helpers, improved session management, improved consistency of conventions, ORM improvements and many more. CakePHP 3.0 comes with increased modularity, allowing you to create more standalone libraries in addition to reducing coupling. Plus, there are tools like PSR-0, PSR-1 and composer which have helped in improving the interoperability. Great community support which can clear any queries about website development in an effective way. Very useful ORM which helps developers to create excellent queries as well as codes. Availability of fantastic plugins to keep the codes clean as well as elegant. Bulky codes. When we compare CakePHP with other frameworks the codes for doing a particular task look huge. It is one of the slowest performing platforms. The loading of codes, even though auto loading options work in a minimum pace. 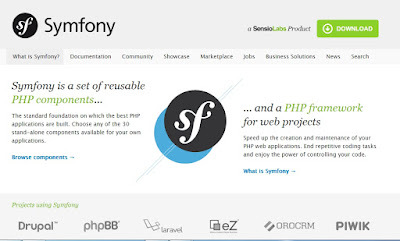 Available in its version 2, Symfony is an excellent PHP Framework for creating websites and web applications. It has been built on top of Symfony components such as Drupal, Ez Publish and phpBB. 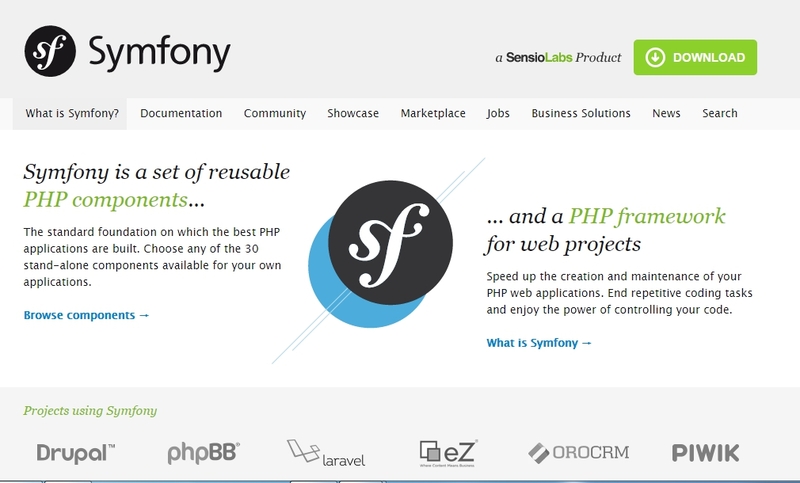 With over 300,000 developers on-board, Symfony has witnessed over 1,000,000 downloads till date. There have been more than 1000 code contributors for Symfony till date. Backed by a huge community of Symfony fans, it is believed that the framework will go to a whole new level in the forthcoming years. Flexibility in setting up projects. Symphony components can be incorporated to much bigger projects like Drupal. The security mechanism of symfony is hard to use. File parsing in symfony is a bit difficult task. Considered as a fast, stable, secure and high-performing PHP framework, Yii has worked wonders for developing Web 2.0 applications. It provides the basis and advanced application installations based on the project requirement. Equipped with Model-View-Controller(MVC) design pattern, rich feature layered caching scheme, Role based access and authentication, Database Access Objects(DAO), Ajax-enabled widgets and a detailed documents; Yii serves as an ideal framework for developing enterprise web applications, social media applications, SaaS, PaaS and a lot more. For doing tasks such as search, pagination, and Grids developers can resort to built-in Ajax. Superb security, and great extensions. Very easy framework to learn. It lacks the support of much needed extensions to create complex applications. The availability of experts is not high in number when we compare Yii2 with other platforms. The community support is not so massive as developers get for CakePHP. Considered as one of the most popular PHP Frameworks for building high performing web applications, Zend comes with cryptographic and secure coding tools which allow you to execute web app development projects in a flawless manner. Some interesting features of Zend framework include: modularity, extensibility, enterprise ready and a vibrant community. It's very robust, well tested and very widely used. 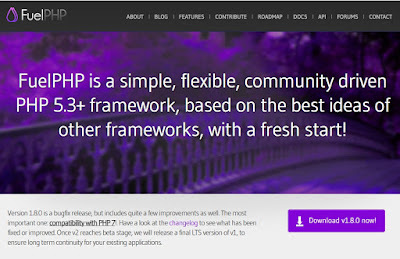 One of the oldest and most trusted frameworks of PHP. It has all the features that a good Web Framework should have. It's really slow compared to other frameworks like Laravel (Voted the best PHP framework for many years now). Documentation is pretty bad. For a newbie, its really hard to understand how things work. FuelPHP is a simple and highly flexible MVC(Model View Control) framework specially created for PHP web developers. Irrespective of whether you’re an experienced PHP developer or an amateur; using FuelPHP framework can turn to be your best decision. PHPFuel supports a router-based approach. That means, you are directly navigated to a closure which deals with input uri, offering the closure a complete control over any further execution. One of the many benefits of Fuel is that there are very few restrictions on how to write code. Just like CodeIgniter framework, FuelPHP is huge community driven framework used for web development. Fuel doesn't force anyone into using modules or an HMVC file structure, but if one chooses to implement them the process is well documented and quite easy to integrate. Once apps are created in a modular structure fashion, it becomes easier for developers with clear benefits. This framework supports input filtering, CSRF prevention with tokens and the Query Builder which assists in preventing any SQL injection attacks. Might be a bit too much to understand for a beginner to intermediate Codeigniter user or PHP developer due to how the file system is laid out. It’s still a relatively new framework which could have caveats that have yet to rear their heads. Although, I encountered no problems when I used it. Documentation is still sparse, a lot of sections are still incomplete. Considered as one of the fastest PHP Frameworks, Phalcon has been implemented as a C extension coupled with lower resource consumption. 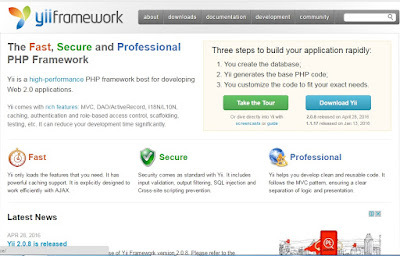 Some of the excellent features included within this PHP Framework are: translations, security, assets management, universal auto-loader and many more. You can use Phalcon for developing full MVC applications viz: single-module, multi-module and micro applications. Excellent documentation, unfortunately not that much 3rd party community support, at lease compared to Silex and Slim. But don’t let this discourage you, you will still find more than enough information. Laravel is yet another brilliant PHP Framework that’s equipped with tons of interesting features including RESTful routing, native PHP or light weight tempting engine and many more. Built using several Symfony components, Laravel offers you web application an amazing foundation of reliable and well-tested code. Some other interesting features of Laravel include: a powerful queue library, an amazing ORM, painless routing and a simple authentication. It uses a blade template engine to speed up compiling tasks, and users can include latest features so easily. "Bundled modularity" enables code reusing without much hassles. Best in the class ORM which is easy to understand, hence creation of database relations appears so simple. An outstanding Artisan CLI comprising advanced tools to do tasks, and migrations. Splendid documentation, and an added feature of reverse routing. It is quite slow, and a new platform for most of the developers to deal with. Amateur developers face problems while extending codes and classes. Community support is not wide in comparison with other platforms. Many methods included in the reverse routing are complex. Authentication : Laravel makes implementing authentication very simple. In fact, almost everything is configured for you out of the box. The authentication configuration file is located at config/auth.php, which contains several well documented options for tweaking the behavior of the authentication services. Routing system: Laravel comes with an easy-to-use approach to routing. The route can be triggered on the application with good flexibility and control. To match the URI, a directory is created. Unit-testing : Laravel is built with testing in mind. In fact, support for testing with PHPUnit is included out of the box, and a phpunit.xml file is already setup for your application. The framework also ships with convenient helper methods allowing you to expressively test your applications. Database: Migrations and Seeding : Migrations are like version control for your database, allowing a team to easily modify and share the application's database schema. Migrations are typically paired with Laravel's schema builder to easily build your application's database schema. Laravel includes a simple method of seeding your database with test data using seed classes. It is an automated process. Database tables can be seeded with default data which can be utilized for application testing or for initial application setup. Laravel is a breath of fresh air. Keep everyone in sync using Laravel's database agnostic migrations andschema builder. Eloquent ORM : The Eloquent ORM included with Laravel provides a beautiful, simple ActiveRecord implementation for working with your database. Each database table has a corresponding "Model" which is used to interact with that table. Models allow you to query for data in your tables, as well as insert new records into the table. Homestead : Laravel strives to make the entire PHP development experience delightful, including your local development environment. Vagrant provides a simple, elegant way to manage and provision Virtual Machines. Laravel Homestead is an official, pre-packaged Vagrant "box" that provides you a wonderful development environment without requiring you to install PHP, HHVM, a web server, and any other server software on your local machine. No more worrying about messing up your operating system! Vagrant boxes are completely disposable. If something goes wrong, you can destroy and re-create the box in minutes! HTTP Middleware : HTTP middleware provide a convenient mechanism for filtering HTTP requests entering your application. Support Blade Templates : Blade is the simple, yet powerful templating engine provided with Laravel. Unlike other popular PHP templating engines, Blade does not restrict you from using plain PHP code in your views. All Blade views are compiled into plain PHP code and cached until they are modified, meaning Blade adds essentially zero overhead to your application. Artisan Console : Artisan is the name of the command-line interface included with Laravel. It provides a number of helpful commands for your use while developing your application. It is driven by the powerful Symfony Console component. Caching : Laravel provides a unified API for various caching systems. Laravel supports popular caching backends like Memcached and Redis out of the box. Filesystem / Cloud Storage : Laravel Flysystem integration provides simple to use drivers for working with local filesystems, Amazon S3, and Rackspace Cloud Storage. Even better, it's amazingly simple to switch between these storage options as the API remains the same for each system. Queue : The Laravel queue service provides a unified API across a variety of different queue back-ends. Queues allow you to defer the processing of a time consuming task, such as sending an e-mail, until a later time which drastically speeds up web requests to your application. Laravel is the most famous as it helps to develop a website using a simple and a clean code in a short time. This web application framework has elegant and expressive syntax. Tasks in the web projects such as authentication, routing, sessions, queuing and caching are made easier. When compared with other frameworks like codeigniter, Laravel has detailed stack trace. Authorization library, widgets with assets like CSS and JS also form part of this futuristic framework. Libraries and models can be used easily because of the fact that Laravel has Object Oriented Libraries supported with auto complete feature. Future of Laravel Having proved its dominance amongst the PHP frameworks, the future of Laravel is bright enough. Many more developers will switch over to Laravel in the coming future. Given the frameworks numerous features and benefits of using them, Laravel will no doubt continues to be a choice for developers. Symfony 2 is the best! I am a laravel developer and I can say laravel is best PHP framework and its Composer-based management functionality make it stand out of other PHP frameworks. I work for Baymediasoft Laravel Application development Service provider in India. Hi, Great.. Tutorial is just awesome..It is really helpful for a newbie like me.. I am a regular follower of your blog. Really very informative post you shared here. Kindly keep blogging.Have a look on Yiioverflow,if you want any software solutions.we bring to you the BEST solutions at nominal rates.